Delano, Minn. (AP) - What once was corn and soybean ground now has more than 4,000 grape vines growing on it. The vineyard near Delano sits on seven of 20 acres Mike and Katie Dickerman purchased six years ago. It has several rows of wooden posts (more than 2,500 in all) with more than 10 miles of wire to hold the vines. All those grapes plus rhubarb from their 400 rhubarb plants and locally grown apples and strawberries are used to make the Dickerman's Woodland Hill Winery wines. Although their venture is fairly young, they spent time before purchasing the land to learn more about commercial winemaking, developing their business plan and research grape production and hardy grape varieties. Their interest in winemaking started innocently as they visited local wineries while on vacation and when they lived in Connecticut, Michigan and North Carolina. When they moved back to Minnesota with their daughter, Alana, Mike dabbled in home wine and beer production at their Woodbury home. He was excited at the results and eagerly discussed starting a winery with Katie. They decided to take the plunge and searched for a home for them and their new business. The Delano location was perfect. The land was good and fairly flat and the location was easy to find along County Road 30. Their farmland was fairly undeveloped. The previous owner had grown many trees that still stand on the property but there were no buildings that could support wine making or a tasting room for visitors. The couple's first task was vine planting. They planted 1,700 vines the first year and another 700 vines the second. Since it takes three years for the vines to mature and bear good fruit, they turned to building their infrastructure. As they lived on the property, their friends and family helped them build a tasting house complete with gift shop and office and, secondly, a wine processing building. The same group helped harvest grapes the first year and put finishing touches on the buildings. "We could not have done this without them," Katie said. The couple tackled the landscaping themselves. Both are avid gardeners and have landscaped the yards at their previous homes. The end result is a welcoming yard of trees, grass and shrubs with special decorations and flowers throughout. "We are adventurers," Katie said of their project. "We aren't afraid to take the risks or to work hard." They complement each other in the business. Mike focuses on the grapes, checking the brix or sugar content, pH levels and acidity of the grapes around late August. Different varieties reach maturity at different times, he said. Harvest can last from August through September. Once the grapes are picked, Jeff presses them. The liquid is fermented and yeast added. When it's ready, he blends the different types to create the special blends from the three red and four white grape types they raise. Katie is the partner with the discerning palate. She tastes the wines as Mike blends them. The result is a variety of special wines including seven whites, three reds and three roses. The wine names are as unique as their pleasing taste. White varieties include Fountain view, a white wine that has citrus, melon and peach flavors. Tickled Pink is a rose with bursts of strawberry and rhubarb aromas. Northwoods Red is obviously a red made from St. Croix grapes with unique plum, cherry and green apple aromas and flavors. Friends and family have helped with the wine tasting but Katie is now hiring staff to help with the crowds that often visit the wineries on weekends. One special worker only asks for a pet and chance to play catch. Vinny, the family's golden retriever, greets visitors at the parking lot often carrying something in his mouth in a quest to play fetch. He leads visitors up the short walkway to the tasting room and enjoys playing with children and adults during their stay. Woodland Hill Winery has only been open to the public for two years, but the couple is pleased with the response to their wine and vineyard. Katie plans several events throughout the year including Christmas tree sales and a New Years Eve celebration. They've hosted two weddings on the property and hope to build an event center to house more celebrations in the future, she said. Their clientele include visitors from nearby Twin Cities interested in a trip to the country and the Woodland Hill Winery experience and many local residents. None of it would be possible without a bounty of grapes. And the vines have provided the yields needed for the couple's growing customer base. In their first year, they bottled 20,000 bottles of wine. This fall they will have 50,000. They could soon reach their maximum production at 100,000 bottles if the current trends continue. "We don't want to get much bigger," Katie said. 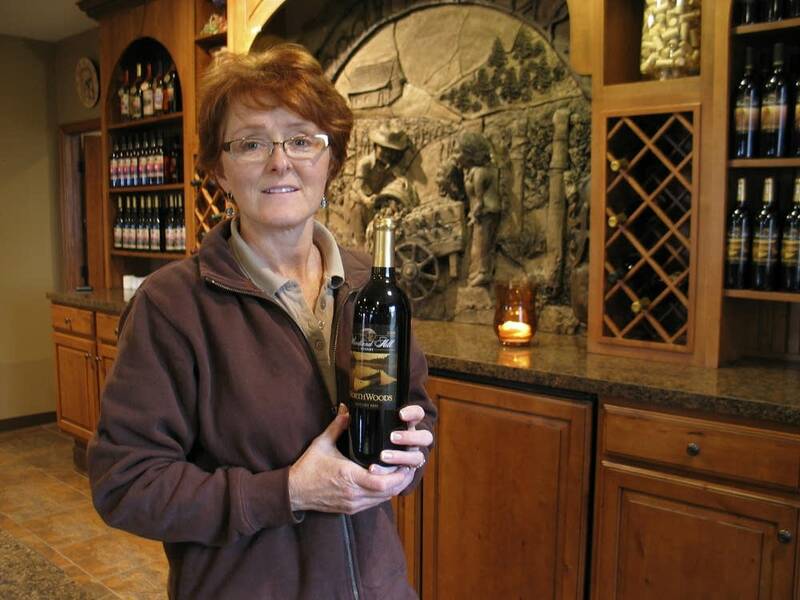 All their hard work and planning has paid off in the variety of wines they offer. They also support local growers and sell wine glasses decorated by a local artist and cheeses made at Cokato's Morning Star Farm. Other local growers' produce is used in wine production including Fall Harvest and Apple Jacks of Delano and Pine Tree Apple Orchards strawberries at White Bear Lake.